Nitra is a city in western Slovakia, situated at the foot of Zobor Mountain in the valley of the river Nitra. 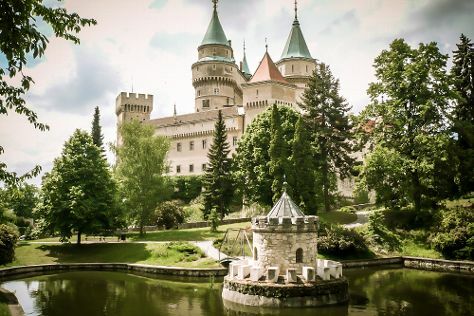 Get some historical perspective at SNM - Bojnice Castle Museum and Nitra Castle. Your cultural itinerary includes sights like Trencin castle and Cerveny Kamen Castle. Get out of town with these interesting Nitra side-trips: Cachtice (Draskovicov manor & Cachtice Castle), Thermal Spas (in Trencianske Teplice) and Museum of prehistory (in Bojnice). There's lots more to do: browse the different shops at City Arena, take in the spiritual surroundings of Kalvaria, stroll through Park na Sihoti, and look for gifts at ONE Fashion Outlet Voderady. To see reviews, photos, traveler tips, and more tourist information, use the Nitra trip itinerary builder app . If you are flying in from Austria, the closest major airport is M. R. Štefánik Airport. Wrap up your sightseeing on the 24th (Wed) early enough to travel back home.